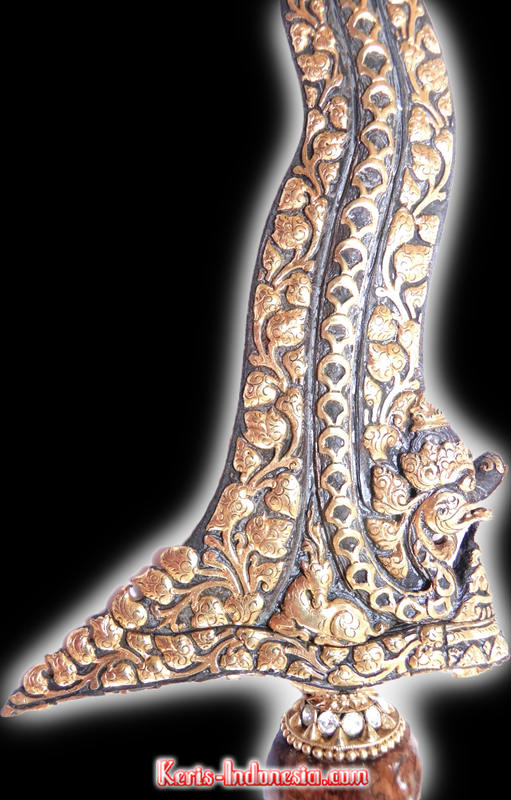 We are happy to offer you a most exclusive work by Sadek, a highly skilled keris artisan in Madura Sumenep. Sadek is particularly skilled in making kerises that feature an extraordinary gandik with a beautiful design of a någå (Sanskrit: ‘nāga‘) on it. Likewise, the gandik of this keris also features the detailed body of a någå whose scales neatly cover the rest of the blade to the tip. Then, gold-plated silver is used for the decoration of the någå‘s body, for if only pure gold had been used it would have required at least 50 grams to complete the full någå body. Both gold and silver are said to have a calming effect to the agressive nature of the någå as well as to the ‘hot temperament’ of the owner of the keris. The Någå Såsrå has become an immensely popular dapur desired by many, which also is part of the reason why this particular design is still produced by the empus today. Though the history of this type of dapur is very unique indeed, for it is said that in the last days of the Måjåpahit Kingdom, a keris with a Någå Såsrå dapur was used to overcome all kinds of problems which occured in the Kingdom at the time. Thus, this keris represents a king’s wealth, while at the same time it is a symbol of hope for the owner to be capable of removing any obstacle he/she faces in life. However, not every person can handle a special keris like this, since it is perhaps more suitable to be owned by someone who has a high position in society.